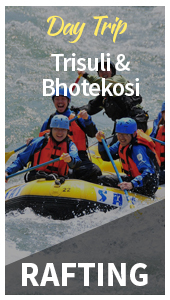 It is located nearby Pokhara at Sarangkot, about 6 hours bus ride from Kathmandu and then next day about 25 minutes drive to Paragliding Spot. Pick up and drop facility is provided from Lake Side Hotel. Tour Facts : The tour provides panoramic views of highest peaks and mountains such as Machhapuchhre Fishtail from altitude of 1425m. 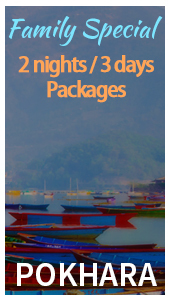 You will also able to view of Pokhara city, Fewa Lake and villages. 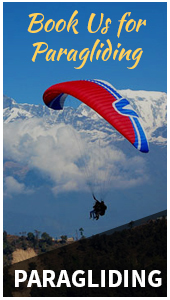 Package Includes Land transportation to and from Pokhara(Sarangkot), 15 to 30 minutes tandem flight, photo video, flight insurance. 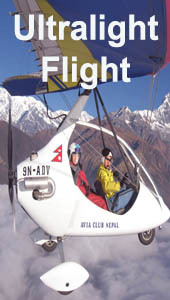 Imagine flying on 1425 m above sea level thrilling experience and viewing Fishtail peak, Fewa lake and villages. Close your eyes and get ready to fly like a bird. The Company is not liable for any refunds after the departure date of the scheduled itinerary. Cancellation should be made 48 hours before departure and a 40% cancellation charge is approved besides tax, transportation and permit. See specific information below. No refund will be given if the program ends before the provided itinerary date. The Company is not to be held responsible for your early termination of a trek should our experienced leader feels it is unsafe for you to continue due to fitness and/or health issues The Company is not liable for an unconvinced or rescheduling due to natural, political or bureaucratic circumstances The Company is not responsible for delays caused by local weather conditions resulting in international flights being missed The Company is not responsible for the financial implications of rescue. 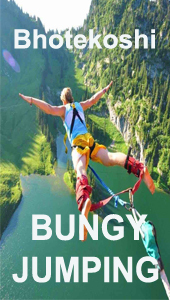 Please ensure you have the appropriate insurance to cover these situations before you arrive in Nepal Our staffs are very experienced in leading treks at all altitudes. It is their responsibility to ensure your safety, their conclusions regard safety are final and should you not follow their advice the Company cannot be held responsible for the outcome. If you wish to cancel your trip for any reason the following scale of charges will apply: Date of Cancellation Charge Incurred 2 months before departure Loss of deposit. (40% of Total Trip Cost TTC.) 29 days to 2 months before departure 50% of TTC. 10 to 28 days before departure 70% of TTC. Less than 10 days before departure 100% of TTC.